TV writer Georgie McCool can’t actually visit the past; all she can do is call it, and hope it picks up. And hope he picks up — because once Georgie realizes she has a magic phone that calls into the past, all she wants is make things right with her husband, Neal. Maybe she can fix the things in their past that seem unfixable in the present. Maybe this stupid phone is giving her a chance to start over. . . . Does Georgie want to start over? A heart-wrenching—and hilarious—take on fate, time, television and true love, Landline asks if two people are ever really on the same path, or whether love just means finding someone who will keep meeting you halfway. Also funny is the fact when I first read Landline, back in 2015, I came out of it thinking it was my least favorite Rowell book, simply because at that time in my life I couldn’t have cared less about married people. But with this reread now, coming after three years, I can’t get enough of family-based stories. So I was delighted to discover how with time my perspective had changed and matured to the point of gobbling up every little detail concerning the marriage chronicled in here. Rainbow Rowell’s signature humor is ever-present and on-point. “It was so rare to make Neal laugh. . . . This. This is exactly it. “I put it in my Save Box,” she said. This right here hits the core on why I write such extensive notes during my reading. Georgie’s office scenes with Seth (and Scotty) reminded me then why I had such a hard reading this book the first time. They weren’t my favorite scenes since no one was shining or bringing anything new to the table. In particular, Seth threw me off my game at the end because I feel like he was flexing, what Reagan in Fangirl so lovingly calls, his best friend muscles just to remind everyone that he came first. I’m not a fan. Also: He can’t write anything decent down without Georgie around, which makes him a true Nick. “They were supposed to end up together, Seth and Georgie. Well, technically, they had ended up together. They’d talked every day since that first day they met. But they were supposed to end up together-together. Everyone thought it would happen—Georgie had thought it would happen. Just as soon as Seth exhausted his other possibilities, as soon as he worked through his queue of admirers. He hadn’t been in any hurry, and Georgie didn’t have a say in the matter. She’d taken a number. She was waiting patiently. And since we’re on the topic of my favorite Rowell book, I was so keen on reading about Neal and Georgie together because it felt like we were seeing Cath and Levi chronicled from Levi’s perspective. Georgie is the one initiating all contact with Neal, making sure she can get a laugh out him (at least one), whereas “solid, stolid” Neal is a tough nut to crack, similar to Cath with their difficulty establishing eye contact and needing a barrier between them, such as drawing cartoons (in Cath’s case, reading fanfiction out loud) to distract. And lucky for him, Georgie doesn’t want the easy thing. To paraphrase Attachments, she likes to work a little harder to get the thing she really wants. “How had she missed Neal until junior year? He’d started working at The Spoon as a freshman, same as her. Georgie must have seen him, without really seeing him, dozens of times. Was she that sucked in by Seth? Seth was extra sucky—pushy and loud, always demanding Georgie’s attention. . . .
Rowell excels at procuring real authentic moments. “How far back?” Georgie tried to fold her arms, but she was still holding that stupid Zima. That moment when people stop playing games (Gemma Collins echo) with one another and just present their real selves… Showing someone you’re keen on them and having it reciprocated is a grand gesture. I’ve been holding off, but I really have to end on the most epic cameo to appear in this book, featuring my all-time favorite couple: Cath & Levi. I really thought before starting that it wouldn’t hit me as hard because I’ve already read it before. But it’s been so long and LEVI’S STILL SO GOOD. “Can we help you find something?” someone said. Georgie turned. It was the ecstatic young couple. Still hanging on each other, as if neither of them could quite believe the other was finally here. “I can’t take your sweater,” Georgie said. LEVI GOES OUT OF HIS WAY TO MAKE SURE GEORGIE GETS SAFELY TO HER DESTINATION (on top of the snowy hill). Levi would do it in a heartbeat!! Cue my tears. I really thought that time would pass and one day I would be ready to move on. But these characters are my home, and I’m never going to stop missing them. 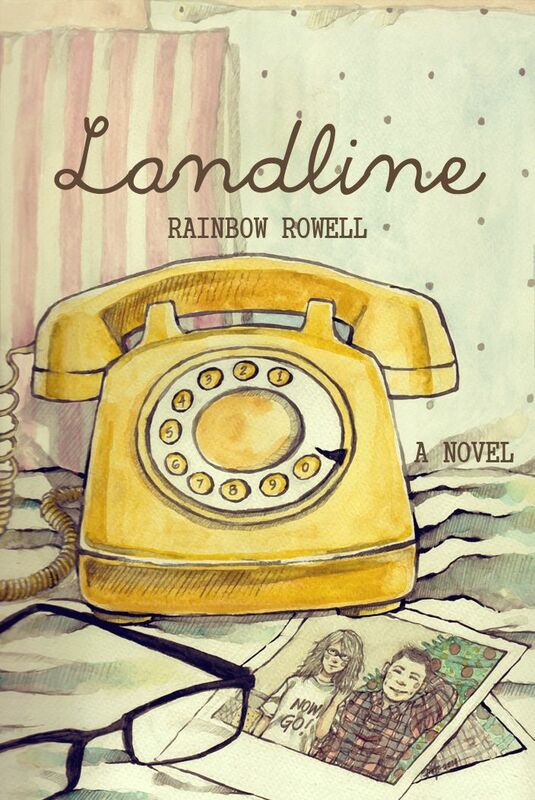 I’ll close off by sharing this beautiful alternate cover for Landline, which has the best details from the book; the Polaroid!! Note: I’m an Amazon Affiliate. If you’re interested in buying Landline, just click on the image below to go through my link. I’ll make a small commission! Why did people ask “What is it about?” as if a novel had to be about only one thing. It’s this opening quote that raised my intrigue by a tenfold on Chimamanda Ngozi Adichie’s Americanah. I’ve read (and reviewed in praise) her previous Nonfiction works (Dear Ijeawele & We Should All Be Feminists) so I knew Adichie to be an author with a compelling way of words, but all that paled in comparison to the character building she excels at exploring in this fictional work of art. So, now comes the difficult part of trying to sum up my reading experience of this grandiose book. Which is also, coincidentally, the first lengthy book I’ve read in awhile, so I took my sweet time savoring its pages over the course of a week. And I’m glad I did because it gave me the chance to mull over my thoughts and feelings regarding Americanah. This was love, to be eager for tomorrow. First and foremost, how does the author succeed so seamlessly at fleshing out a side character even if they come to show only one time??? Time and again, I was dumbfounded at Adichie’s success in cultivating characters so full of life with a single page or two, sometimes needing only one paragraph. This is raw talent right here. I’m a sucker for books full of eccentric and subtle quips on life, so Americanah fell prey to my immediate affection. However, this is also where my later issues with the book stem from since I came to depend on those familiar, detailed intimacies on everyday life to propel the book forward more than the actual storyline. My mind was on a never-ending wait for more noteworthy remarks to drop, instead of caring for any actual development in the plot. It was also a bit of a bummer to learn that the most important person in Ifemelu’s life could not have made me feel number. Sitting through whole chapters from Obinze’s viewpoint left those parts of the book marred for me, as a result. His later persona, lacking that quiet strength that made up the arc of his youth, didn’t work in his favor, as well. It’s the stark contrast between the joy and quickness Ifem’s chapters provided with them, in comparison to the snail-paced reading I experienced with Obinze that staggered me. Why is she essentially telling me to be grateful for antisemitism?? Opting for the wrong approach where they teach hundreds of little girls to take it like a compliment when boys use abuse to get attention??? I listened to a lecture recently on antisemitism and seeing a comment like the above to excuse this systematic form of oppression made me livid. When this book expertly offers us an intimate look into Ifemelu’s young love with Obinze by including us in their private inside jokes that only those two get. Like, referring to him as “Ceiling” in public and making everyone wonder about the story behind it. The amount of specificity the author offers to her characters astonished me time and again. To quote Ifem’s blog, she offers “Lagos from an Insider,” and there’s an unequivocal honesty to it. I can’t get over that last line. Blaine was one of the more interesting boyfriends of Ifem’s past. I liked, in particular, their initial encounter on the train the very same day Ifemelu drops her efforts at assimilating with faking an American accent. Theirs was a fascinating dynamic that I loved seeing chronicled. Sifting through Ifemelu’s past and playing this game of catch-up, there hits a certain moment when things start to feel exhausting and previous plot lines are forgotten (like, Ifem getting her hair braided in present day, which we keep returning to) in the process of reading this richly told story spanning three continents and numerous lives. And circling back to the present after being so caught up in the past is when my enthralment for the story usually goes down by a notch… That is until another noteworthy line gets dropped on us. I couldn’t have been more grateful to Kosi for saying what I always yell at men who want to leave their wives and families to satisfy some impulse. “It’s a cowardly, dishonest book. Have you read it?” Shan asked. “I read a review,” Mirabelle said. That is to say, I’m more than eager to discover the power of Adichie’s words in exploring her other books. Note: I’m an Amazon Affiliate. If you’re interested in buying Americanah, just click on the image below to go through my link. I’ll make a small commission!